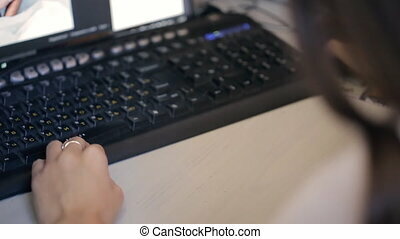 Young girl sitting without looking up in front of her a huge monitor writes a pen. In the background there are numerous folders with documents. In the picture are the man and woman that actively sell him the idea or approves the project. On the table lay a paper, graphics, drawings. The focus is the woman, the man out of focus The office in which there are 2 people and minimalistic with green plants. Probably it is the manager's active sales may designer, art director, or just a modern creative person. On the other hands she can be creating concept for project or web design, designing something associated with the magazine or news articles. Part of my manager working at office or agency series. She looks very enthusiastic, interested and self-confident. Real professional. In the picture are the man and woman that actively sell him the idea or approves the project. On the table lay a paper, graphics, drawings. 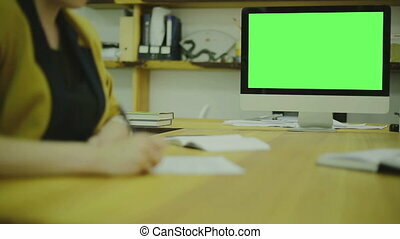 The focus is the woman, out of focus in the foreground a man in the background greenery office. The man is clearly not kept pace with the story and directed by women. Probably it is the manager's active sales may designer, art director, or just a modern creative person. On the other hands she can be creating concept for project or web design, designing something associated with the magazine or news articles. Part of my manager working at office or agency series. 15 second clip. young woman architect sitting in an office and makes compass measurements. next lie plate, ruler, pencil. in the background there are numerous folders with documents. Excellent picture for demonstration office space. young woman architect sitting in an office and makes compass measurements and makes the correction to the plate. Nearby lie the plate, ruler, pencil, phone. In the background there are numerous folders with documents. Excellent picture for demonstration office space. Focus on monitor. Closeup of writing a text on paper. In the picture you can see the focus on monitor in the office standing on a wooden table, as we see a young woman out of focus and the fact that she takes notes on paper. Probably, it is ux programmer, maybe she text designer, web developer or just an employee working away from computer screens. It is the ideal frames to illustrate topics such as writing a handwritten information or work without a computer. Also well so as always connected, waiting for new messages, the display light and intensive work. Great Depth of field and bokeh. 1920 x 1080 FullHD Resolution. 35 second clip. 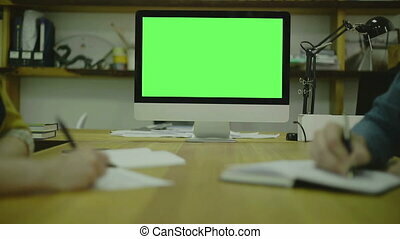 You can replace green screen with the footage or picture you want. You can do it with Keying effect in Adobe After Effects , check out tutorials on YouTube. Focus on monitor. Closeup of writing a text on paper. 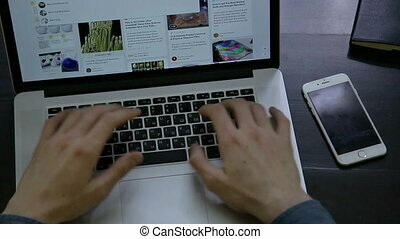 In the picture you can see the focus on monitor in the office standing on a wooden table, as we see a young woman out of focus and the fact that she takes notes on paper. Probably, it is ux programmer, maybe she text designer, web developer or just an employee working away from computer screens. It is the ideal frames to illustrate topics such as writing a handwritten information or work without a computer. Also well so as always connected, waiting for new messages, the display light and intensive work. Great Depth of field and bokeh. 1920 x 1080 FullHD Resolution. 35 second clip. You can do it with Keying effect in Adobe After Effects , check out tutorials on YouTube. Focus on monitor. Closeup of writing a text on paper. 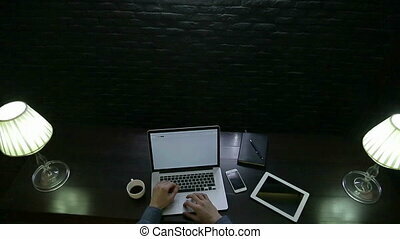 In the picture you can see the focus on monitor in the office standing on a wooden table, as we see a young woman out of focus and the fact that she takes notes on paper. Probably, it is ux programmer, maybe she text designer, web developer or just an employee working away from computer screens. It is the ideal frames to illustrate topics such as writing a handwritten information or work without a computer. Also well so as always connected, waiting for new messages, the display light and intensive work. Great Depth of field and bokeh. 1920 x 1080 FullHD Resolution. 13 second clip. 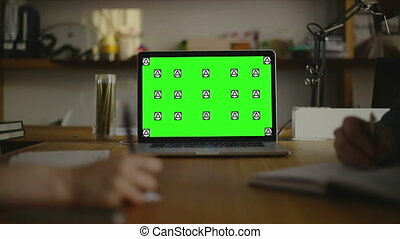 You can replace green screen with the footage or picture you want. You can do it with Keying effect in Adobe After Effects , check out tutorials on YouTube.